Abubakar, U., Yusuf, K., Abdu, G., Saidu, S., Jamila, G., Fatima, A. (2017). Ethnopharmacological survey of medicinal plants used for the management of pediatric ailments in Kano State, Nigeria. Research Journal of Pharmacognosy, 4(3), 29-39. U.S. Abubakar; K.M. Yusuf; G.T. Abdu; S.R. Saidu; G.A. Jamila; A. Fatima. "Ethnopharmacological survey of medicinal plants used for the management of pediatric ailments in Kano State, Nigeria". Research Journal of Pharmacognosy, 4, 3, 2017, 29-39. Abubakar, U., Yusuf, K., Abdu, G., Saidu, S., Jamila, G., Fatima, A. (2017). 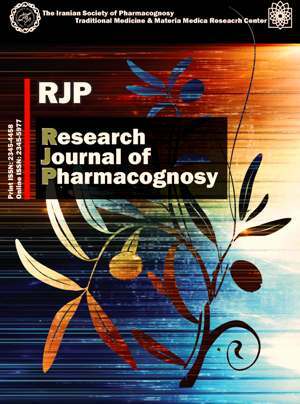 'Ethnopharmacological survey of medicinal plants used for the management of pediatric ailments in Kano State, Nigeria', Research Journal of Pharmacognosy, 4(3), pp. 29-39. Abubakar, U., Yusuf, K., Abdu, G., Saidu, S., Jamila, G., Fatima, A. Ethnopharmacological survey of medicinal plants used for the management of pediatric ailments in Kano State, Nigeria. Research Journal of Pharmacognosy, 2017; 4(3): 29-39. Bioresources Development Centre, Kano, National Biotechnology Development Agency (NABDA), Abuja, Nigeria. Background and objectives: The knowledge of traditional uses of plant species used in the management of pediatric diseases in Kano State is still intact with the traditional healers; thus, the present study was aimed to collect, identify and document plant species used traditionally for the management of pediatric diseases in the study area. Methods: The ethnobotanical data was collected through informal interviews with the traditional medicine practitioners, traditional birth attendants, herb sellers and some health workers. Results: A total number of sixty eight plant species belonging to thirty five families were reported to be used in the disease management among children in the study area. Most of the plants species belonged to the Fabaceae, Poaceae, Anarcadiaceae, Asteraceae, Combretaceae and Solanaceae families, while Anogeissus leiocarpus, Boswellia dalzielii and Citrus sinensis were the most frequently mentioned plant species. Leaves and stem bark were the most used plant parts in this study. Conclusions: Further studies should be conducted to evaluate the pharmacological activities of the plant species that have not yet been investigated and also to identify the phytochemical constituents responsible for their activities. Hatfield NT. Broadribb’s introductory paediatric nursing. 7th ed. Massachuset: Lippincott Williams and Wilkins, 2007. Gardiner P, Dvorkin L, Kemper KJ. Supplement use growing among children and adolescents. Pediatr Ann. 2004; 33(4): 227-232. Liu L, Johnson HE, Cousens S. Global, regional and national causes of child mortality: an updated systematic analysis for 2010 with time trends since 2000. Lancet. 2012; 379(9832): 2151-2161. World Health Organization. Ten facts on child health. Geneva: World Health Organization, 2012. Frenk J, Chen L, Bhutta ZA, Cohen J, Crisp N, Evans T. Health professionals for a new century: transforming education to strengthen health systems in an interdependent world. Lancet. 2010; 376(9756): 1923-1958. Kamatenesi MM, Acipa A, Oryem-Origa H. Medicinal plants of Otwal and Ngai sub-counties in Oyam district, Northern Uganda. J Ethnobiol Ethnomed. 2011; Article ID PMC3029220. Bassey ME, Effiong EO. Preliminary investigation of herbs used in paediatric care among the people of Akwa Ibom State Nigeria. J Nat Prod Plant Resour. 2011; 1(3): 33-42. Newman DJ. Natural products as leads to potential drugs: an old process or the new hope for drug discovery? J Med Chem. 2008; 51(9): 2589-2599. Yetein MH, Houessou LG, Lougbe´gnon TO, Teka O, Tente B. Ethnobotanical study of medicinal plants used for the treatment of malaria in plateau of Allada, Benin (West Africa). J Ethnopharmacol. 2013; 146(1): 154-163. Salisu M, Muhammad ND, Ishaq AA. Ethnobotanical survey of medicinal plants in metropolitan Kano, Nigeria. Int J Public Health Res. 2015; 3(6): 345-351. Abubakar US, Yusuf KM, Abdu GT, Tyokyaa TT, Sagir H, Mujahid MN, Joseph M, Muhammad S. Ethnobotanical survey of medicinal plants used for the treatment of malaria in Kano metropolis. Res J Pharm Biol Chem Sci. 2016; 7(4): 2033-2040. Helen EN, Kabiru S, Fatima MM, Zainab OA, Salisu N, Lawan DF. Ethnobotanical survey of medicinal plants used by Hausa people in the management of Diabetes mellitus in Kano metropolis, northern Nigeria. European J Med Plants. 2017; 18(2): 1-10. Patricia N, Maud K, Anywar G. Medicinal plants used in pediatric health care in Namungalwe sub county, Iganga District, Uganda. Nova J Med Biol Sci. 2014; 3(2): 1-8. Kamatenesi M, Hannington O, Dominic W. Enthnopharmacological screenings of Vernonia amygdalina and Cleome gynandra traditionally used in child birth in Western Uganda. Proceeding of the 11th NAPRECA symposium on natural products and discovery. 2005 Oct 9-12; Antananarivo, Madagascar. Geissler PW, Harris SA, Prince RJ, Olsen A, Achieng’Odhiambo R, Oketch-Rabah H. Medicinal plants used by Luo mothers and children in Bondo District, Kenya. J Ethnopharmacol. 2002; 83(1): 39-54. Maliwichi-Nyirenda CP, Maliwichi LL. Medicinal plants used for contraception and pregnancy-related cases in Malawi: a case study of Mulanje District. J Med Plants Res. 2010; 4(20): 3024-3030. Rahman AHM, Ismot MAP. Study of medicinal uses on Fabaceae family at Rajshashi, Bangladesh. Res Plant Sci. 2014; 2(1): 6-8. Kavya D, Kumar VCG. Grasses: an underestimated medicinal repository. J Med Plants. 2013; 1(3): 151-157. Sani HD, Aliyu BS. A survey of major ethno medicinal plants of Kano north, Nigeria, their knowledge and uses by traditional healers. Bayero J Pure Appl Sci. 2011; 4(2): 28-34. Gedson RML, Igor RP, Marcelo RDC, Neyres ZT, Jose MB, Analucia GSC, Augusto LS, Josen FT, Leonia MB. Bioactives of the genus Combretum (Combretaceae): a review. Molecules. 2012; 17(8): 9142-9206. Ahmad HA. Review on Anoigeissus leiocarpus, a potent African traditional drug. Int J Res Pharm Chem. 2014; 4(3): 496-500. Taiwo O, Xu HX, Lee SF. Antibacterial activities of extracts from Nigerian chewing sticks. Phytother Res. 1999; 13(8): 675-679. Kubmarawa D. Preliminary phytochemical and antimicrobial screening of 50 medicinal plants from Nigeria. Afr J Biotechnol. 2007; 6(14): 1690-1696. Adigun JO, Amupitan JO, Kelly DR. Isolation and investigation of antimicrobial effect of 3,4,3'-tri-O-methylflavellagic acid and its glucoside from Anogeissus leocarpus. B Chem Soc Ethiopia. 2000; 14(2): 169-174. Ademola IO, Eloff JN. In vitro anthelmintic effect of Anogeissus leiocarpus (DC) Guill. and Perr. leaf extracts and fractions on developmental stages of haemonchus contortus. Afr J Tradit Complement Altern Med. 2011; 8(2): 134-139. Agaie BM, Onyeyili PA. Anthelmintic activity of the crude aqueous leaf extracts of Anogeissus leiocarpus in sheep. Afr J Biotechnol. 2007; 6(13): 1511-1515. Soro D. In vivo anthelmintic activity of Anogeissus leiocarpus Guill & Perr (Combretaceae) against nematodes in naturally infected sheep. Parasitol Res. 2013; 112(7): 2681-2688. Vonthron-Senecheau C. In vitro antiplasmodial activity and cytotoxicity of ethnobotanically selected Ivorian plants. J Ethnopharmacol. 2003; 87(2-3): 221-225. Akanbi OM. The antiplasmodial activity of Anogeissus leiocarpus and its effect on oxidative stress and lipid profile in mice infected with Plasmodium bergheii. Parasitol Res. 2012; 110(1): 219-226. Atawodi SE. In vitro trypanocidal effect of methanolic extract of some Nigerian savannah plants. Afr J Biotechnol. 2003; 2(9): 317-321. Victor YA. In vitro assessment of antioxidant and antimicrobial activities of methanol extracts of six wound healing medicinal plants. J Nat Sci Res. 2013; 3(1): 74-80. Victor BYA, Grace A. Phytochemical studies, in vitro antibacterial activities and antioxidant properties of the methanolic and ethylacetate extracts of the leaves of Anogeissus leiocarpus. Int J Biochem Res Rev. 2013; 3(2): 173-145. Olutayo O, Doyinsola I, Simon O, Abayomi O, Thomas S. Phytochemical and antioxidant properties of some Nigerian medicinal plants. Am J Sci Ind Res. 2011; 4(3): 328-332. Atawodi SE, Adekunle OO, Bala I. Antioxidant, organ protective and ameliorative properties of methanol extract of Anogeissus leiocarpus stem bark against carbon tetrachloride induced liver injury. Int J Pharm Sci Res. 2011; 2(7): 1443-1448. Sonibare MA, Moody JO, Adesanya EO. Use of medicinal plants for the treatment of measles in Nigeria. J Ethnopharmacol. 2009; 122(2): 268-272. Nadembega PJI, Boussim JB, Nikiema FP, Antognoni F. Medicinal plants in Baskoure, Kourittenga Province, Burkina Faso: an ethnobotanical study. J Ethnopharmacol. 2011; 133(2): 378-395. Fawzi MM, Priyamka DS. A quantitative ethnopharmacological documentation of natural pharmacological agents used by pediatric patients in Mauritius. BioMed Res Int. 2014; 13(5): 1-14.